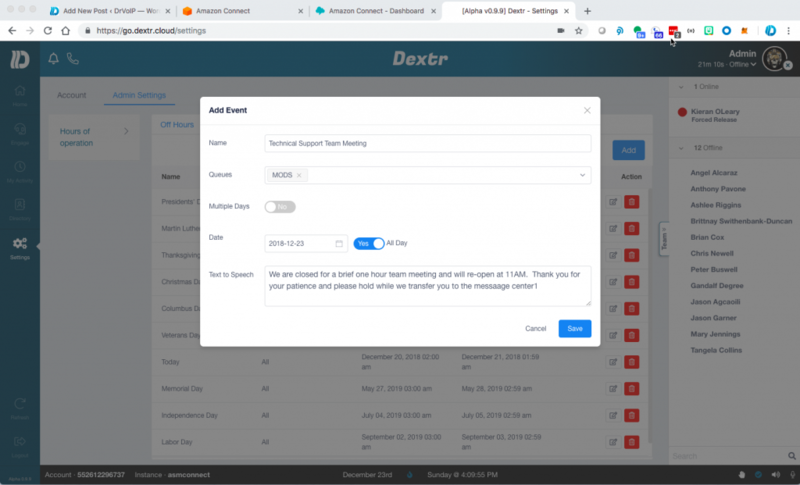 Dextr a Customized Agent Dashboard for #AmazonConnect Call Center! Building out call centers on AWS, you learn a lot about opportunities for productivity enhancements! 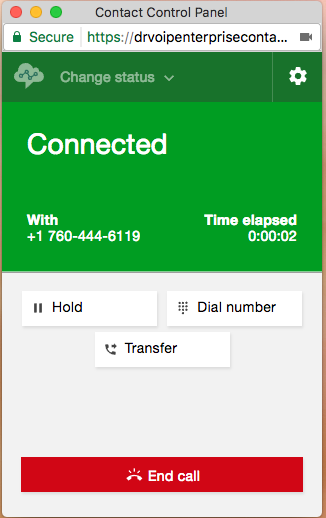 One of the first issues that we noted was that the standard Contact Control Panel or CCP, which is basically a WebRTC soft phone client, though very useful has many opportunities for improving the Agent experience. The list of request features is growing and as a result, we have taken on the development of a customizable AWS Connect Agent Dashboard! Call DrVoIP for AWS Call Center migration assistance. If your only introduction to AWS is Connect, their cloud based call center product, you have successfully created your first call center instance and you are now taking inbound phone calls! It was remarkably easy and with no real ‘geek” training, most call center professionals were able to log in, setup an instance, organize a call flows, create agents and voice prompts, obtain a phone number an in a few hours, you were taking phone calls! Wow! Did you know that the Agent CCP is completely customizable? AWS provides a number of API’s and Connect Streams that a software engineer can access toward the goal of building an Agent Dashboard with a set of features and tools that are unique to your call center environment. There is even a site you can log into and test some of the available API’s. If you go to http://connectdemo.com and click on the “demo sites” you can see some examples of customized CCP, Click to Call, Screen Pops and other tasty code bits. We note that there are many “connect streams” that a developer can tap to create their own version of CCP. The supervisor side, however is not as fully formed and there are not as many streams and API’s available to support Supervisor requirements like real time queue and agent metrics. In fact we had to develop our own socket layer communication strategy to implement the features we envisioned in our dashboard. Recently we have discovered new and not readily available API for other AWS streams. Some are only available depending on your support contract status. The list of functions and features that we have added to our CCP is still growing but we set a goal of making the dashboard painless! For example there is nothing to install. Our application needs to be added by your instance administrator as an application end point in the Connect dashboard. Once that is complete, the user just points at our portal and enters their instance name (you can even upload your own logo). The traditional AWS Connect CCP shows up and you login as normal. Once your credentials are established, you are then presented with the revised Agent Dashboard as shown below. Most folks have asked for a “team status” display. As an Agent I want to see the status of the other agents on my team. So the first attribute we added was just that, a team status display. Each agent has their own Activity List showing all of their calls both inbound and outbound. Next to each call is a link to hear the recording of that call. Supervisors can select all calls, but agents only see their own call recordings. Ability to set Holiday Schedules and “ad hoc” closings with new close prompt (think team meeting). Push Announcement String out to Agent Dashboard for alerts and other notices. We are also planning to integrate or Click2WebChat functionality as an advanced feature option. This would bring website co-browsing, video chat, SMS and keyboard chat into the call center! The Dextr screen shows the Agent interface including the Video and Chat links. How do you set a Holiday Schedule in Amazon Connect? Dextr enables a user with Admin privileges to open a window and create both HOLIDAYS AND AD HOC closings. The instance is initially stocked with all US Federal holidays already listed. The Admin can modify, add or delete these dates. They can also specify, via the drop down window, which queues they are closing. There is also a Text to Speech window in which the supervisor can enter the text of a prompt that will be played to a caller should they call during that time slot. 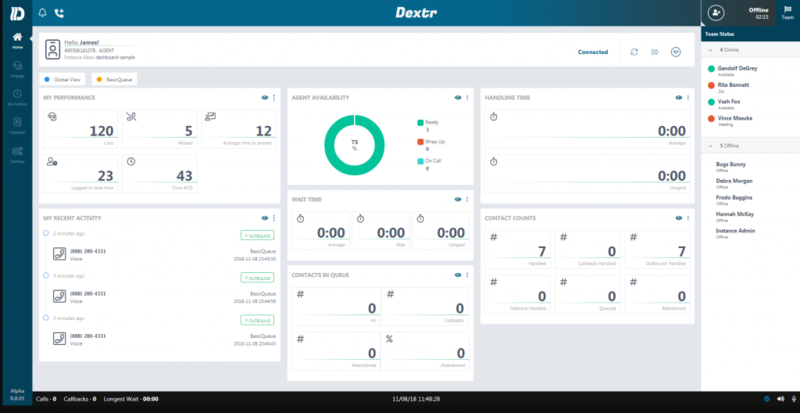 We named the dashboard Dextr! There is nothing to install. Follow the video instruction below and have your Amazon Connect Administrator add us as a trusted application, then head over to our portal, log in and put Dextr to work for your team! If you have a requirement for the CCP we would also like to know more about your requirements, so let us know.If you do not have an AWS Connect instance, DrVoIP will build you a “proof of concept” portal for no charge! Remember, the American Business Communications landscape will be littered with the bleaching bones of those companies that do not adopt AWS Connect as the enterprise call center that manages customer engagements!